Welfare conditionality within the social security system is largely ineffective and in some cases pushes people into poverty and crime, our major study has found. Supporters say the use of sanctions and support is an effective way of weaning people off benefits and into paid work, or addressing anti-social behaviour. However, critics argue that behavioural conditionality is largely ineffective in promoting paid employment and personal responsibility, and is likely to exacerbate social exclusion among disadvantaged populations. 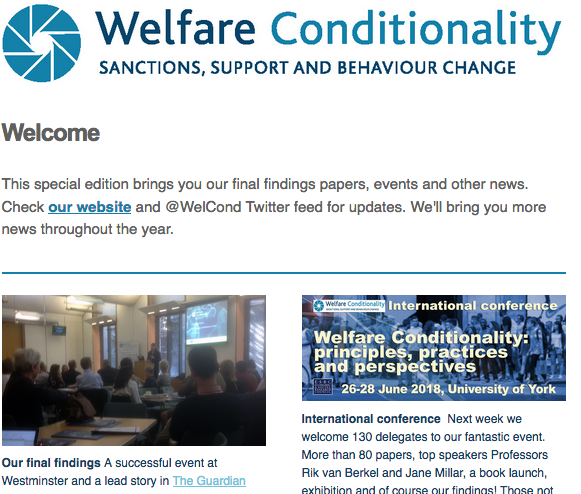 Our WelCond project, led by the University of York and involving the Universities of Glasgow, Sheffield, Salford, Sheffield Hallam and Heriot-Watt, analysed the effectiveness, impact and ethics of welfare conditionality from 2013-2018. The findings are based on repeat longitudinal interviews undertaken with 339 people in England and Scotland and drawn from nine policy areas, including Universal Credit, disabled people, migrants, lone parents, offenders and homeless people. WelCond Director Professor Peter Dwyer, from the University of York’s Department of Social Policy and Social Work, said: “Our review reveals that in the majority of cases welfare conditionality doesn’t work as intended and we have evidence it has increased poverty and pushed some people into survival crime.